Khayrullo Mirsaidov. Image by Antuan Veselov. Widely shared. 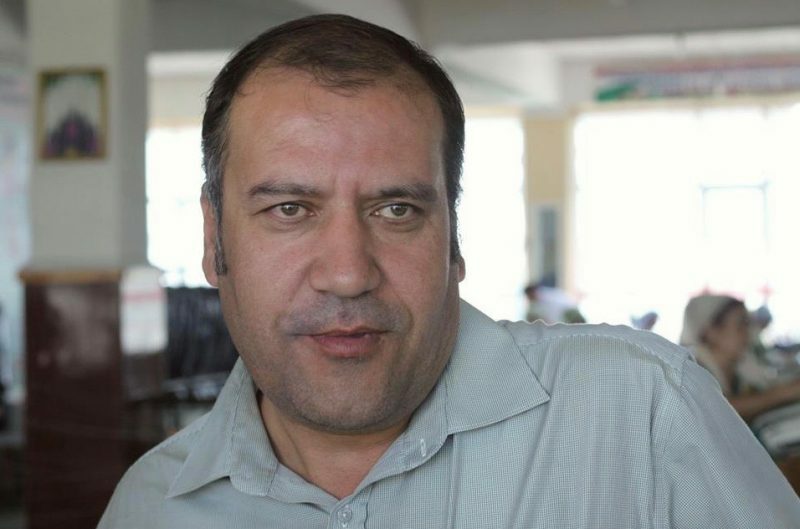 A court in Tajikistan has caved to mounting international pressure and released a whistle-blowing journalist who had previously been sentenced  to 12 years in prison. In the surprise ruling, Sughd regional court ordered that Khairullo Mirsaidov walk free from court on August 22, although the conviction on charges of embezzlement, forging documents and providing false testimony remains in force. Mirsaidov’s lawyer, Bakhtiyor Nasrulloyev, told  Asia-Plus news agency that his client must still pay 80,000 somoni ($8,500) in fines, perform community service and pay one-fifth of his salary to the state for a period of two years. This gesture of clemency — an almost unheard-of climbdown for a justice system rarely given to backtracking in intensely politicized cases — appears to have been in part a recognition of the international attention  garnered by Mirsaidov’s plight. The #FreeKhayrullo hashtag had got some considerable traction on social media and was even adopted  by the British ambassador in Tajikistan. The saga has its roots  in a standoff between Mirsaidov and well-placed officials in his local Sughd region. In November, the journalist, who also captains a popular competitive comedy troupe, published an open letter to President Emomali Rahmon detailing the confrontation and allegations of corruption. But on December 5, it was Mirsaidov himself who was arrested. Despite presenting no immediate threat to the public, he was placed in custody and had remained there until now. His supporters have said all the charges were fabricated and without foundation. The response from rights advocates to Mirsaidov being freed has been mixed. While there is satisfaction he will no longer remain behind bars, the fact the conviction has been upheld has been greeted with disappointment. It is noteworthy that it is public attention that appears to have earned Mirsaidov his freedom. Before his sentencing in July, the international diplomatic community maintained a largely silent front. Western diplomats in Central Asia typically argue that behind-the-scenes negotiations are more effective than arm-twisting in the open, but the 12-year prison term seems to have shocked many of them out of complacency. Immediately after the ruling, the embassies of the United Kingdom, Germany, France, the United States, and the EU Delegation in Tajikistan issued a joint statement  to condemn what they termed an “extremely harsh” punishment that was out of proportion with the charges. More ominously for Dushanbe, the embassies intimated there could be some real-world consequences. “We are concerned that this sentence will compromise our joint struggle for good governance and thus cast a shadow on our cooperation,” their statement said. Tajik authorities had evidently not expected such an outpouring of indignation and reacted in the first place with wounded defensiveness. They also doubled down on the media repression by threatening  journalists thinking about covering the case. “Discussion and criticism of the verdict by mass media can be regarded as obstruction of justice and is in violation of journalistic ethics,” the General Prosecutor’s Office said in a statement. Other recent social media campaigns have had similarly unexpected impacts. When the severely ill four-year-old grandson of Muhiddin Kabiri, the exiled leader of the banned Islamic Renaissance Party of Tajikistan, or IRPT, was denied permission to leave the country for urgent treatment for cancer, it sparked considerable outcry. The travel restriction appeared to be a government reprisal against Kabiri. Online petitions circulated widely before Hamza Tillozoda was granted a passport and allowed to fly out of Dushanbe. In a similar episode, the 10-year-old daughter of an exiled opposition activist, Shabnam Khudoydodova, was on August 7 pulled off a plane  as she was departing to visit her mother in Poland. The travel prohibition was quickly dubbed a cruel and politically motivated act of reprisal against Khudoydodova. In a signal of a change of stance, however, the young girl was allowed to leave the country some days later. It is difficult to fathom whether any of these developments indicate the government intends to moderate its increasingly hardline and indiscriminate behavior toward all and any dissidents. The true test will come with the cases of the jailed IRPT leadership , who were thrown behind bars after they were accused of involvement in a likely inexistent coup plot in September 2015. Even more grievous is the fate of Buzurgmehr Yorov, a lawyer who was sentenced to lengthy terms in prison, on charges that most agree were trumped-up, as a reprisal for his willingness to represent the IRPT in court. Unconfirmed rumors have indicated that the government is considering granting clemency to the more than a dozen imprisoned members of the IRPT leadership council in exchange for them committing to publicly denounce their self-exiled leader, Kabiri. The same scuttlebutt suggests that the prisoners have declined that bargain.